The capital of Golog prefecture, Dawu has little in the way of attractions (as such) but is a useful transport and services hub. It also sits amidst some classic Golog grasslands-and-mountains scenery which is ideal for hiking. 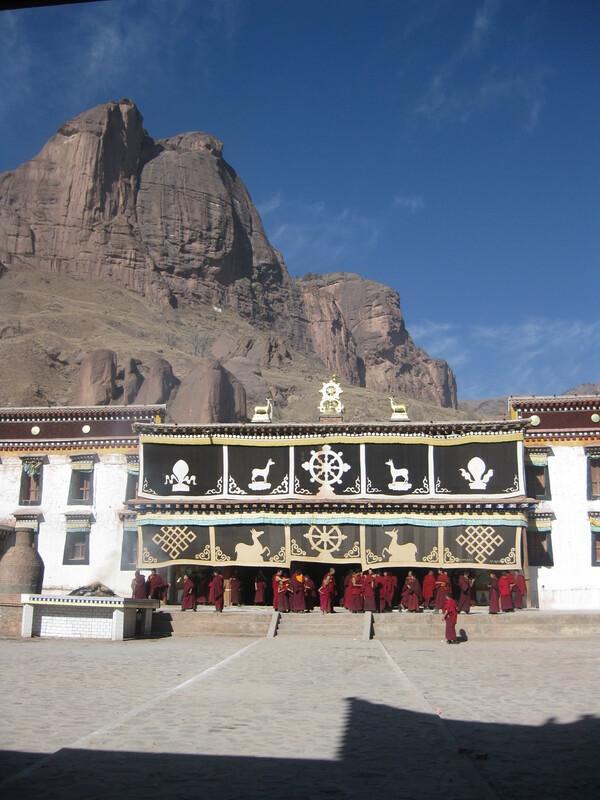 Aside from wandering up and down the main street, or through the nearby grasslands, the main show in Dawu is the monastery complex at the town’s extreme northern edge. While the monastery buildings themselves are relatively unimpressive (compared to others in the region), the setting is simple spectacular. 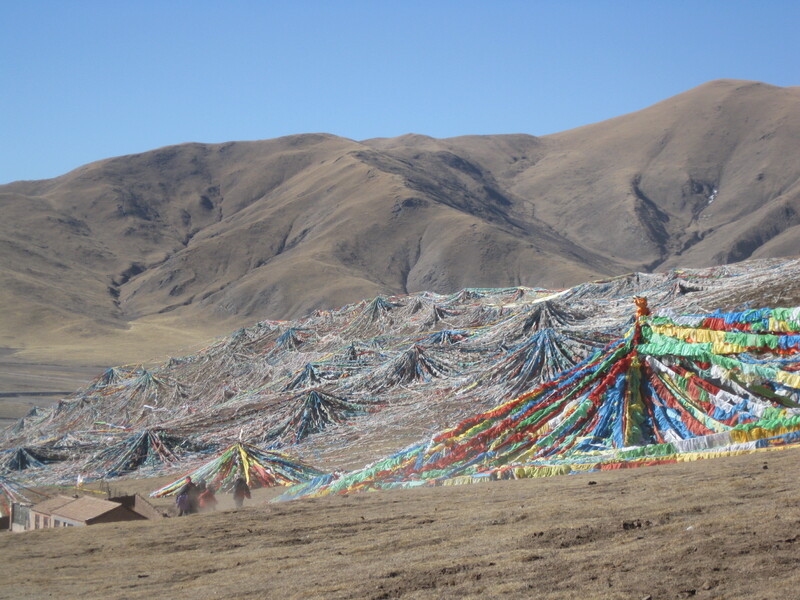 Immediately behind the monastery looms a hill completely smothered in an extraordinary web of prayer flags. Join the throngs of pilgrims circumambulating the hill (and the entire monastery) for fantastic views over the whole scene – the monastery, the technicolor hill, and the town and mountains beyond. Multiple buses leave Xining for Dawu daily (8-10 hours, 95元). While most are sleeper buses that arrive at an ungodly hour of the morning (try to get the 7 or 8pm from Xining! ), there are a couple of “business express” minibuses that do the trip in 6-7 hours during the day (and, consequently, cost more). The Dawu bus station has departures for all counties of Golog prefecture, Aba (Sichuan), and even Chengdu (24-plus hours, sleeper)! 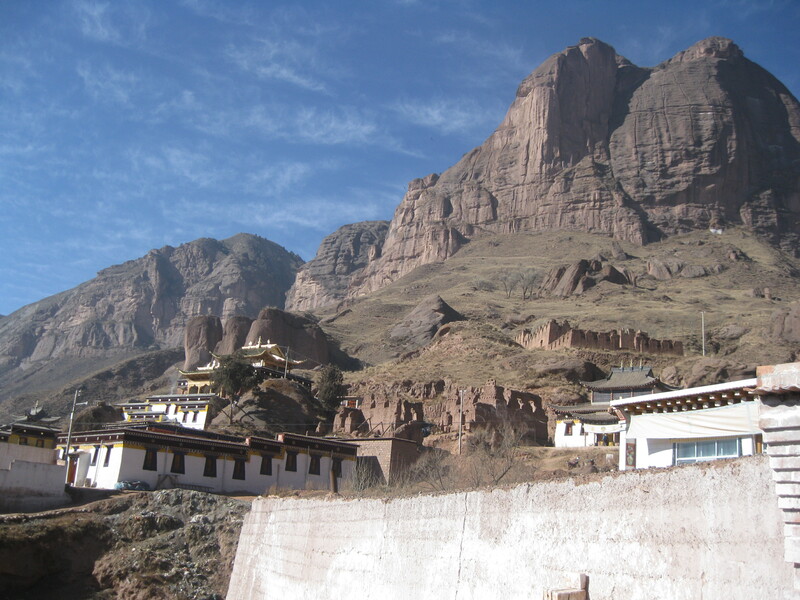 Approximately 70 kilometers northeast of Dawu town, the small town of Ragya (ch Lajia 拉加) is famous for its large monastery. Lying on the Yellow River at a comparatively low altitude of 3050 meters, sheltered Ragya can be a welcome respite from the frigid breezes sweeping at high velocity across the rest of the prefecture. The reconstructed monastery lies on the river’s north bank under impressive sandstone peaks. In addition to its religious activities, the monastery is also associated with a renowned boys school (immediately to the east) and a girls’ school closer to town. From Dawu, numerous cars leave for Rabgya from outside the bus station; from Xining, just hop out of any Dawu-bound bus or car at the main intersection in town. Amidst this spectacularly wild region of peaks, gorges and grasslands, one mountain range stands out – the high snowy domes of Amnye Machen. Scraping the sky at well over 20,000 feet, these peaks retain a sanctity for Tibetans exceeded only by the distant Gang Rinpoche (Mt. Kailas) in far Ngari. And as with Kailas, pilgrims come to this place (typically in fall and spring; summer is rainy and winter is brutally cold) to complete a kora around the mountain. The circuit is well over 100km long and generally takes at least eight days to complete (potentially longer if you are carrying your own packs). 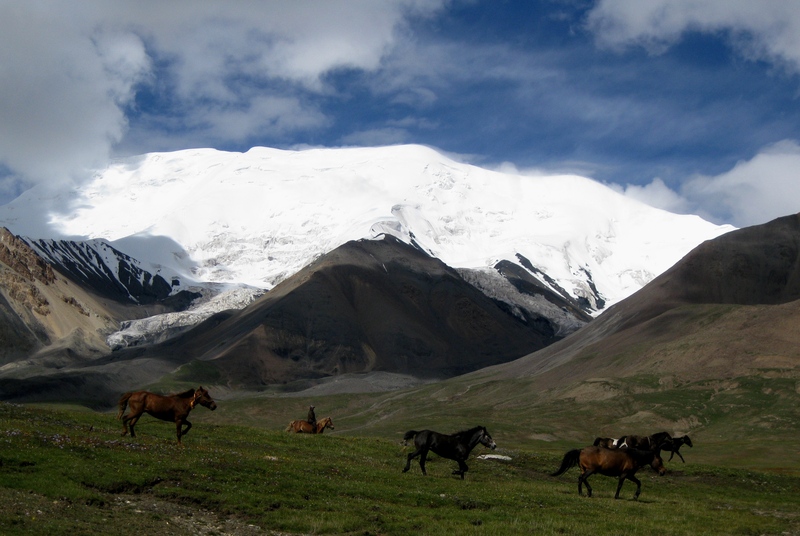 As the kora rarely dips below 4000m (and spends significant amounts of time at 4500-4700m), many foreigners choose to rent yaks or horses rather than carry their own packs. If you are not accustomed to high-altitude trekking, have a poor map and/or don’t have the necessary skills in backcountry navigation, wilderness medicine and risk management, I strongly recommend doing the kora as a guided trip. You must be prepared for numerous river crossings, kilometers of ankletwisting tussocky high-grassland marsh, and frighteningly changeable weather. This trip is more similar to an Alaskan backpacking trip than any other I’ve taken outside of Alaska; be prepared for the vast and unforgiving scale of the place, and be mindful that if anything happens, you are a long way from help (and even longer from medical care). That being said, for an easier experience do the circuit’s northern half, which follows an occasionally washed-out dirt road. This page has the best available map of the circuit. While many of the religious sites are incorrectly mapped, the topography is excellent. Make sure if printing this map that you use A3 paper (11×17) or larger, otherwise the details will not be visible. Rumor has it (early 2014) that the authorities might be instituting a 100 yuan fee for this area in summer 2014 or 2015. Ask Tibetan Connections in Xining for the latest. Hi Jonas, great blog!!! 🙂 I’m planning to make a trip to qinghai in the second half of may. And was originally thinking to visit banma.. The information you were giving here about the closed counties.. is it up to date? It is up to date as far as I can tell. I haven’t been to these places recently, but the information reflects what I’ve heard. what would you recommend for a half khora ? ( i had in mind from Xiaodawu to Xueshan as we’d like to get over some passes. In how long do you think it can be completed? is it easy to find transportation and yaks , guides? im trekking with a friend all around Qinghai, and we areuncertain about to go or not to go at amnye machin. the place seems stunning, but all the recent report we can read stated that construction work make the kora awfull. Last I’ve heard, the North side is somewhat in-destruction from road construction. The south side should still be OK. Contact travel agencies (Tib-owned) in Xining for details. Tibetan Connections and Snow Lion are good.